The cupboard may be full of pots and pans, with everything from pricey stainless steel to cast iron handed down for generations, to non-stick and magic copper. But most cooks have favorites, and when one of those Teflon favorites seems ready for the trash can, a bit of tender loving care may revive it, at least for a few more meals. 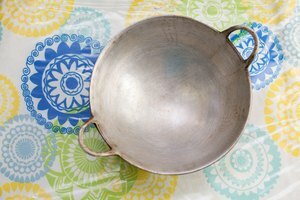 A light touch of elbow grease and a dab of oil brings a scratched and burned Teflon-coated frying pan back to life. Like many inventions, Teflon was an accident waiting to be discovered. The year was 1938 and the scientist, Roy Plunkett, was tinkering with polymers with names so long that none of us will remember them. The bottom line is that the experiment gone wrong yielded a powder that was heat-resistant and one that other substances wouldn’t adhere to. Further investigation and experimentation brought Teflon out of the laboratory. From the atom bomb of the historic Manhattan Project to the pots-and-pans cupboard, Teflon made a name for itself. A new, non-stick Teflon pan comes with instructions. Read them. Starting out right extends the life of the sparkling, new frying pan. Rinse it in warm water, dry and then put a little vegetable or coconut oil on a paper towel. Do not use olive oil – it’s a low-heat oil and residue may smoke when exposed to high heat. It’ll also create a dark buildup on the surface of the pan that is difficult to remove. Rub the oil around the surface. The pan may be non-stick, but seasoning it adds an extra coating that’s a barrier between the pan bottom and any food or hard utensil. 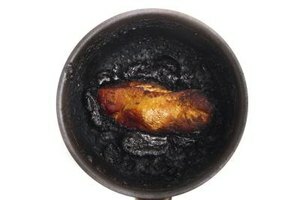 Fast forward several years and time has taken its toll on your beloved frying pan. Scratches from metal utensils are evident, burn marks from lack of oil dot the bottom, and food is sticking. It’s time for another seasoning. In fact, this should be done several times a year. The oil fills up the dents and scratches and keeps the surface of the Teflon even and non-stick. Cooking and seasoning a Teflon-coated frying pan are simultaneous. Add oil to the pan before turning on the stovetop heat, letting them both reach temperature at the same time. This allows the pan to absorb a bit of the oil before the food sops it up, increasing its non-stick properties. Also, a Teflon pan heated without oil can put off unhealthy fumes. Don’t try to save on calories by using nonstick cooking spray. It spells trouble for your nonstick pan by building up on the surface to a point where it’s difficult to remove. An oil mister with your oil of choice is best for monitoring calories. Don’t expect a Teflon pan to have a long life. Five years of steady use is about the maximum lifespan of an often-used Teflon pan, regardless of the price. Be prepared to let it go when the time comes, but keep it healthy until that fateful day. Wash the pan with warm water and the soft side of a kitchen sponge. Don’t use an abrasive sponge or cloth as it’ll start to wear down the Teflon. Wash the pan by hand, never in the dishwasher. Harsh detergents and the hot temperature settings of the dishwasher dry out the Teflon surface. Storage is also a key to the pan’s longer life. Avoid scratching by placing a cloth, napkin or rubber separator between pans if you are stacking them in the cupboard. When it’s time to replace the Teflon frying pan, consider choosing one that’s enamel-coated. While the toxic emissions from Teflon are minute, especially at high heat, enamel coating or Thermolon are safer alternatives. Both have non-stick properties, are non-reactive and non-toxic. A well-seasoned and often-used cast-iron pan is also non-stick. Just be sure to allow the food to come to its final heating and cooking point before taking it from the pan. Don’t pull on the meat or food being cooked. It’s done when it naturally releases itself from the pan – like magic! L.A.Times: Time To Toss Your Non-Stick Pans? Maybe Not. Quick and Dirty Tips: Are Nonstick Pans Safe? 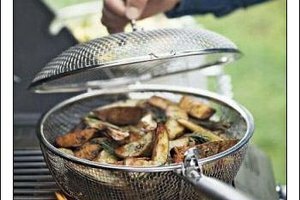 How to Use Pots on a Gas Grill?